During the 13-year insurgency (1961–74) in Portuguese Africa, more than 800,000 men and women served in the Portuguese armed forces. Of this number, about 9,000 served as commandos (or about 1 percent). Yet their combat losses ― 357 dead, 28 missing in action and 771 wounded ― represented 11.5 percent of the total casualties (a percentage 10 times that of normal troops). It is well established that these warriors were responsible for the elimination of more insurgents and capturing more of their weapons than any other force during the war. Great pains were taken to stay abreast of the latest enemy operational methods and maintain the 'warrior edge' in the force. This edge, in essence, was an approach to fighting that pushed the commandos always to think of themselves as the hunter rather than the hunted. Officers returning from contact with the enemy were rigorously debriefed, and commando instructors regularly participated in operations to learn of the latest enemy developments. This information was integrated with intelligence from other sources gathered by the military and national intelligence services, and from this current knowledge, training was constantly revised to remain attuned to the enemy and his behavior. The commandos became a breed apart - and their reputation was such that when insurgents discovered a unit deployed into their area, they would generally withdraw until the killers left. 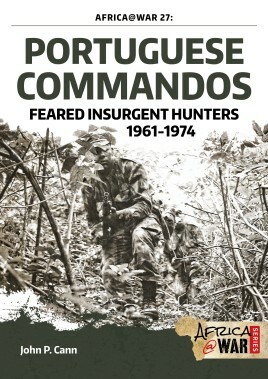 This commando training - and its sympathy with the fighting environment - made the commandos the most effective ground force in the Portuguese Army. The commandos were expert practitioners in the art of counterinsurgency, and their practice of destroying the enemy in great numbers quickly and quietly served as inspiration not only to South Africa and Rhodesia, but to the enemy himself. This is the story of the Portuguese commandos: their beginnings, their unique operations and their legacy and influence in subsequent sister units such as the Buffalo Battalion of South Africa.